The thematic component of this film is appropriately modulated. Lean enough to prime the audience without condescending. There is brevity to the approach that makes it all the more potent for what it doesn’t say. For instance a major plot point of the past is left almost entirely to the viewer’s imagination to draw horrific imagery. This character based story goes for the jugular with scaring follow through. 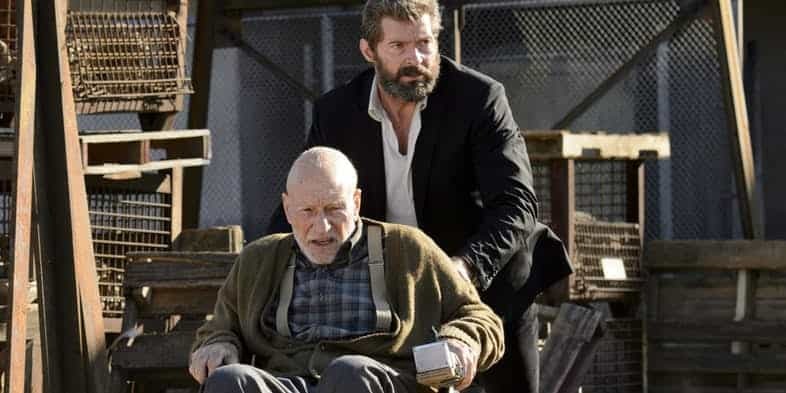 Set in a future where mutants are all but extinct, a noticeably deteriorating Logan is weary and tortured. He is a mutated man whose lifetimes of violence and regret have been drenched in the blood and pain of ferocious rage. Hugh Jackman’s former force of nature Wolverine limps, he staggers and he bleeds. He carries a defeated self hatred. A certainty he is undeserving of relief from the soul crushing wounds of his past. As someone who has been indifferent to Jackman’s portrayal of James “Logan” Howlett over the length of the franchise his performance here has me eating my words. From the instant we first meet the clawed one and he utters the most appropriate opening line imaginable to establish where his character is in consciousness Jackman dominates. Gone were the physical theatrics and flourishes replaced by a pragmatic approach whether in combat scenes or dramatic. Movement is straight forward and communication is blunt as this haggard anti-hero navigates the landscape. Driving a limo across the border Logan attempts to keep a low profile while trying to score prescription medication for the Nonagenerian Charles Xavier in his care. Aiding Logan is the albino mutant tracker Caliban played with a gentle self preservation by Stephen Merchant. Xavier has become a danger to himself and others as dementia takes its toll on “the world’s most dangerous mind”. In the familiar part Patrick Stewart eagerly explores the unfamiliar revealing deeper more human vulnerability. He purposefully reduces his stoic presence allowing others to command the frame while bittersweet humor and the occasional scold remain true to the circumstance. The loaded arrival of a muted 12 year old Laura to Logan’s life soon sees the 3 men and a little girl embark on a desperate road trip for survival where the ultimate villain could be seen as mortality and morality. Newcomer Dafne Keen unleashes such a cyclonic presence as the young Laura that her expressive physicality is a ferocious feral frenzy only limited by the size of the frame she is given to dominate. That Director James Mangold (COPLAND, IDENTITY) sites Eastwood’s THE UNFORGIVEN & THE GAUNTLET along with Aronofsky’s THE WRESTLER and the John Wayne western THE COWBOYS as influences is no surprise. After all, LOGAN takes the masculinity and morality from classic westerns (like SHANE which serves a thematic purpose) and places it in the dusty asphalt plains of 2029 to set the tone. It also makes sense that the Director is talking about releasing a black and white version in the near future. Mangold could be an interesting case study for studio interference in relation to creative vision. Looking back at his 2013 effort THE WOLVERINE, a project originally intended for Darren Aronofsky who walked once the studio balked at his insistence the film be a hard R (Hugh Jackman had to take a significant pay cut before the studio agreed to LOGAN being an R) is at its best when working on a human level before becoming a soulless CG spectacle in the final act. That human level is LOGAN’s strength too and I find it hard not to wonder what we would have gotten 4 years ago if that “big” finale would have instead been more intimate and character focused. 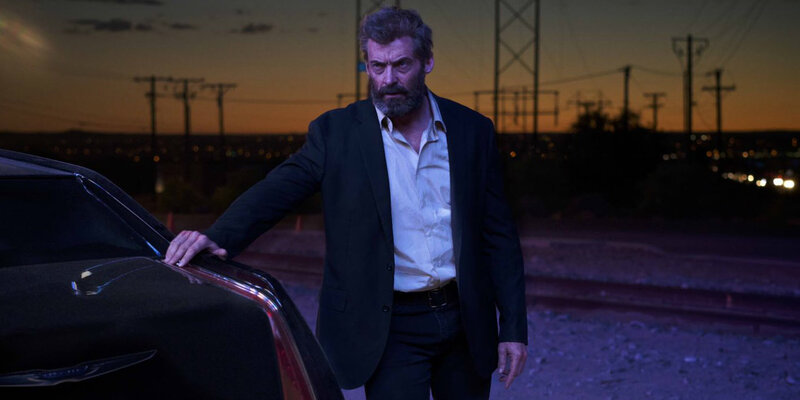 Mangold’s direction of LOGAN is discreet, never drawing attention to itself, letting scenes achieve their goals without artifice or noticeable technique for its own sake. The sparse script by Scott Frank (GET SHORTY, OUT OF SIGHT) & Michael Green (AMERICAN GODS), has the kind of primal and psychological follow through that few studio pictures can get away with…and I’m not just talking about tearing flesh and red stuff here. It’s refreshing this film doesn’t try to subvert or be too self-aware just focuses on telling its fable as honestly as possible. It’s impossible to not at least acknowledge this is an X-Men film. 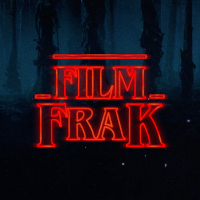 It’s part of a franchise. For narrative this is of no consequence but the baggage of Wolverine and Xavier in the cinema universe only bolsters what would have emotionally registered even as a standalone film.